Playing in their 3-5-2 system, Juventus performed to a high standard with control over the game. This was both when in possession, with a strong short passing game oriented around the attacking trio of Pogba, Morata and Dybala, and out of possession with a stable man-oriented pressing scheme with good compactness. At the bottom of the table and without a win this season, Verona never really were in the game and created only 0.27 xG to Juventus’ 1.39. An xG map of the game, courtesy of Tegen11. Expected goals is a statistic which measure the probability, and thus the value, of a shot being taken dependent on a number of factors. Through analysing the situation of the shots throughout the game, we can see that not only did Juventus create more shots, but they were of a higher quality too with two particularly high chances being made. Allegri’s men set out with a fairly full-strength side against bottom-placed Verona, with the likes of Pogba, Dybala and Marchisio all starting the game. The 3-man defensive consisted of Chiellini, Bonucci and Caceres from left to right in front of, as ever, Gianluigi Buffon. Claudio Marchisio was the deepest of the midfield trio, supporting the deeper building game with the similarly-deep Khedira to his right, and a much more advanced Pogba in the left of the midfield. On either side of them, Alex Sandro and Stefan Lichtsteiner provided the width. Claiming a goal and an assist to his name, Dybala acted in the 10 space but played alongside other striker Alvaro Morata. Coming to Turin without a win all season and sitting rock bottom of the table with just 8 points, Hellas Verona took on a fairly standard 4-2-3-1 shape. Gollini was the goalkeeper behind a back four of Souprayen, Helander, Moas and Bianchetti. Hallfredsson and Greco occupied the double pivot slots, flanked by Silgardi and Wszolek. Ionita was the supporting striker behind Pazzini up front. Although they were not posed with much threat from Verona, who have scored a league-low 12 goals all season, Juventus still looked impressive in defence. 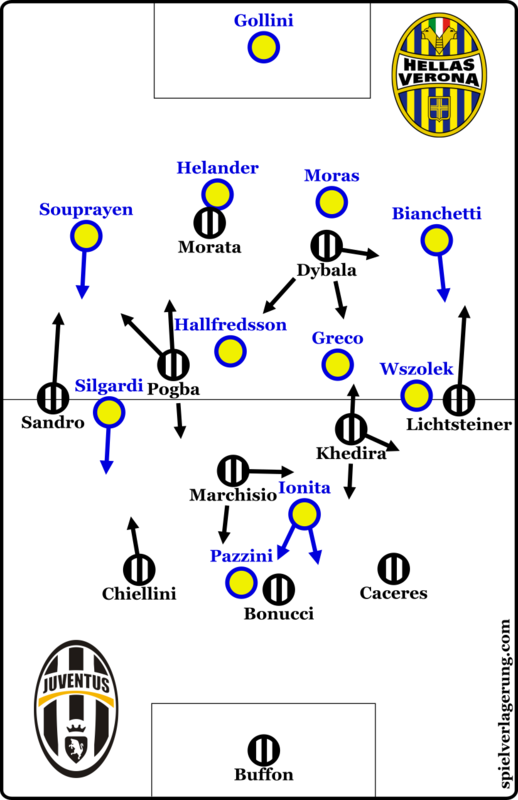 Using a man-oriented pressing scheme, Allegri’s side were strong in maintaining stability in a reactive defensive system. Albeit this was helped by Verona’s lack of attacking fluidity at times, they generally managed to maintain pressure on the ball and surrounding players for the majority of the game. Defending between a 3-5-2 and a 5-3-2-0, a key aspect of their defensive setup was the orientation of the two forwards. Both would drop close to the central midfield three, especially so when the wing-backs were in the defensive line and unable to provide support. This meant that Juventus generally had good occupation of the middle of the pitch with 5 players covering the space well. They displayed a good level of compactness whilst doing so, which further enhanced their ability to have defensive control (as well as generally all other defensive actions) by restricting Verona from moving the ball into any dangerous areas on the pitch. 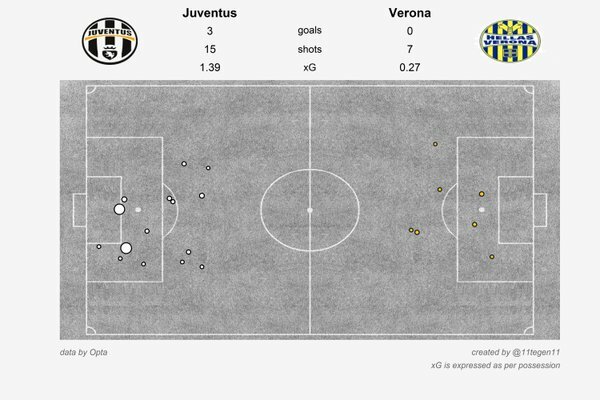 Juventus impressed more with the ball than without, as they comfortably played through the Verona lines of defence through the duration of the match. In their building game, Bonucci and co. were never troubled by the Verona side who didn’t often look to press, and when they did, it was uncoordinated and left gaps to simply move the ball into. With a pre-existing 3-chain in the first line and the support of Marchisio and Khedira, they comfortably had the numerical advantage on their side which brought stability with it. This stable build-up allowed Juventus to prepare well for progressing the ball upfield with a good spacing of the defensive line which covered the pitch from half-space to half-space and opened up the passing lanes well. Chiellini in particular took advantage of this and would make a number of penetrative passes from the left half-space, usually towards Pogba or Alex Sandro. Without having to worry about potential turnovers to the hands of Verona, they could be focused more towards developing central access directly from a deep position. One of the more interesting aspects of Juventus’ possession game was their asymmetrical midfield shape. As expected given the skillsets of the two players, Sami Khedira largely dropped in the right half-space and would support Marchisio in build-up whilst Pogba took on a much higher position, usually beyond the Verona midfield line. Effectively this created a 3-4-2-1 with Dybala and Pogba working behind the leading Morata. The midfield adaptation provided structural balance in a flexible shape. Considering his abilities, Pogba is inclined to drive forward during an attack where he can maximise his offensive potential. With this knowledge, Khedira can balance these movements by playing a more reserved role and maintaining balance within the midfield by dropping deeper, which in turn gives Pogba more attacking freedom. Not only this, but it also supports the balance of the shape higher up, as Khedira’s deeper positioning provides more space for Dybala to act between the lines with more freedom. This shape allowed for an attacking trio between Pogba, Morata and Dybala to flourish well too. The presence and occupation of the 10 space by the deeper two attackers increased Juventus’ ability to find central access during the above-mentioned build-up as the two repeatedly received vertical passes from the likes of Marchisio deeper. They often served as the link between the midfield and attack, breaking forward in a quick drive towards the Verona goal after receiving between the lines. Benefiting quite consistently in the game, Juventus were focused on breaking through the 3 central columns between that attacking trio. The wings were sometimes used in the 1st phase of possession, usually just for means of rhythm in the movement of the ball and they served a few roles higher up. At times the wing-back would receive a pass if there was too high pressure in the centre, so they acted as a way to relieve pressure and ensure retention of ball possession. Another use would be to create an isolation, which was used quite sparingly as Juventus preferred to make their attacks through the centre. The wings did have an important influence on most attacks however, providing the width needed at times to effectively open up gaps between the half-spaces in which the attackers could create chances. Particularly in the build-up, Alex Sandro would stay close to the touchline and open up the left half-space which enabled Pogba to find an incisive pass which cut through the midfield. Obviously Juventus had it pretty easy in the game, as Verona put up little challenge in a weak performance. Defensively they lacked compactness which lead to an immediate overload in the midfield due to the presence of Pogba and Dybala. Because of this they failed to protect the half-spaces too, whilst Juventus could use the wings more too as it was easier to bring the ball back inside. The staggering of their defensive block was also a significant problem for them, even more so when they defended in the 4-4-2 shape which could be seen throughout. In three straight banks of players, they offered little in the way of protecting the spaces between the lines which Juventus thrived on in their shape. Allegri’s team were far superior in this aspect and it really helped emphasise the benefits of the asymmetrical midfield – Pogba found possession far too often behind the Verona midfield whilst Khedira was rarely covered during the initial build-up of possession. In attack, they rarely got into a position to create a good chance as the attacks often broke down early in the Juventus third. Verona’s spacing in attack was often to blame as weak connections, for example with too many players on one line or incorrect distances to the ball, meant that they failed to progress the ball into high-pressure areas as a team. To do so individually is an unsustainable method (unless you happen to be Lionel Messi or Martin Ødegod…). After Dybala’s early free-kick, the result of the game wasn’t ever in doubt really. After Juventus’ shocking start to the season, they are now back on track to be heavily involved in the title challenge, even if they are being contested well by Inter, Fiorentina and Napoli. Stars such as Pogba are returning to their high levels whilst they possess brilliant young players such as Dybala – who is showing all the makings of an excellent forward. 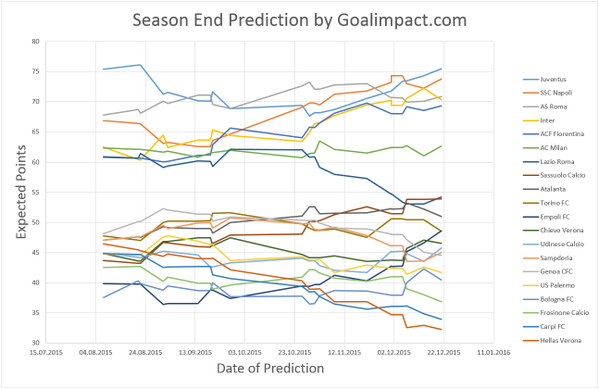 GoalImpact’s Serie A points trajectories. Juventus dropped down after a poor start but are now back on track.